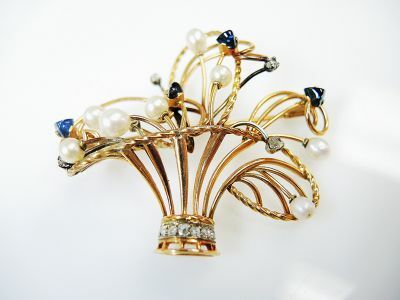 Fall in love with this beautiful 15kt (English) yellow gold floral basket brooch, featuring 11 rose cut diamonds, est. 0.21ct (clarity:SI-I1 & H-I colour); 4 triangular cabochon dark blue sapphires, est. 2.11ct and 8 creamy white pearls, approx. 4.19-5.31-6.0mm.